A unique experience in Chiang Mai hospitality. With accommodation, great food, drinks, massage, bar, free internet and wifi, live music and the Sunday walking street market. Great Chiang Mai accommodation. Our guesthouse is an oasis in the center of old Chiang Mai surrounded by ancient temples...A "must see" on your visit to Northern Thailand. Please note: The Garden is now under new management that do not use this website. Our guesthouse accommodation is like a budget hotel or hostel or bed and breakfast. While we do have staff in the guesthouse at all times we do not have a night service or room service but you can help yourself to drinks when the bar and restaurant are closed. Also we are very secure here and all guests have keys for access all day and night. Here at "The Garden" we aim to provide a home from home. Our Chiang mai accommodation is much more personal than a hotel. 'SEE YEK GLANG WIANG'. .. See= 4 .. Yek= ways == crossroads. Glang Wiang = Centre of the walled town. We are 50 meters from this road junction at 139 Ratchadamnoen road which is also the Sunday market street. (The only traffic lights on Ratchadamnoen). We are almost opposite the new U hotel. Please note we are 'The Garden Chiang Mai' guesthouse or SUAN CAFE, not the 'Chiang Mai Garden Guesthouse'. For travel information to and from Chiang Mai by plane, bus or train visit our Transportation section. Every Sunday the street outside the guesthouse gates is closed to traffic and turns into the Chiang Mai walking street market selling mostly arts and crafts with music and dance groups. The guesthouse is set back from the road in a beautiful garden and is an oasis of peace where you can relax and watch the world go by. The Cafe/restaurant serves a large selection of hot and cold drinks and we have a fully licenced bar. Delicious meals are served until late evening. The restaurant is closed on mondays. Every Sunday we have live music in the garden during the walking street market featuring a variety of styles. We also provide clean economical guesthouse accommodation in this unique setting. Solar heated water and electric back up ensures constant hot water and all rooms have air conditioning. Our Chiang Mai accommodation prices include FREE INTERNET and there is a strong wifi signal in all our rooms and the garden....Early booking is recommended!!. We have just redecorated (April 2010) so the rooms are fresh and clean and even better value !! Our room 'A' now has fridge, TV with 65 channels by cable, DVD, a sitting area and balcony as well as a large double bed. WE OFFER FREE INTERNET AND WIFI FOR ALL OUR CUSTOMERS AND IN THE CAFE AND GARDEN THERE ARE TV'S WITH CABLE PROGRAMMING SO YOU CAN KEEP UP WITH THE MAJOR SPORT AND NEWS EVENTS. We have just upgraded our wifi internet to true broadband supplied by cable so this is a fast reliable Chiang Mai wifi internet hot spot. We have everything we need to pamper and spoil you and make your visit truly something to write home about. 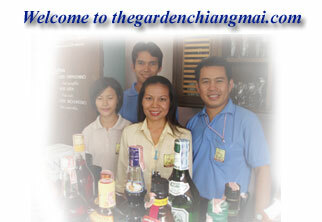 We look forward to your visit to "The Garden" Chiang mai, guesthouse, cafe and internet. Have a nice day and hope to see you soon.